Divert construction, demolition and land-clearing debris from disposal in landfills and incinerators. Redirect recyclable recovered resources back to the manufacturing process. Redirect reusable materials to appropriate sites. Recycle and/or salvage at least 50% of non-hazardous construction and demolition debris. 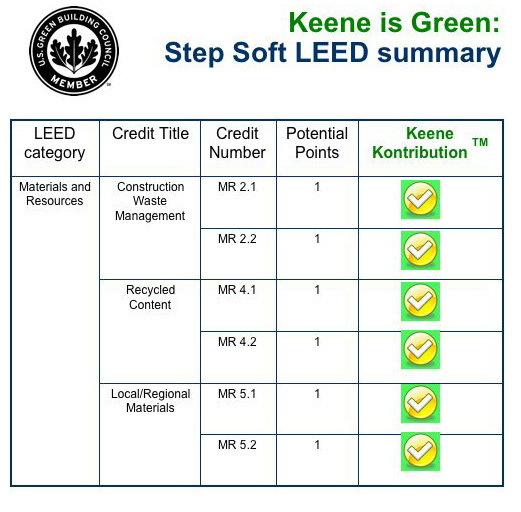 Develop and implement a construction waste management plan that, at a minimum, identifies the materials to be diverted from disposal and whether the materials will be sorted on-site or co-mingled. Excavated soil and land-clearing debris do not contribute to this credit. Calculations can be done by weight or volume, but must be consistent throughout. Use materials with recycled content such that the sum of post-consumer recycled content plus one-half of the pre-consumer content constitutes at least 10% (based on cost) of the total value of the materials in the project. The recycled content value of a material assembly shall be determined by weight. The recycled fraction of the assembly is then multiplied by the cost of assembly to determine the recycled content value. Mechanical, electrical and plumbing components and specialty items such as elevators shall not be included in this calculation. Only include materials permanently installed in the project. Furniture may be included, providing it is included consistently in MR Credits 3–7. Recycled content shall be defined in accordance with the International Organization of Standards document, ISO 14021—Environmental labels and declarations—Self-declared environmental claims (Type II environmental labeling). Pre-consumer material is defined as material diverted from the waste stream during the manufacturing process. Excluded is reutilization of materials such as rework, regrind or scrap generated in a process and capable of being reclaimed within the same process that generated it. Use building materials or products that have been extracted, harvested or recovered, as well as manufactured, within 500 miles of the project site for a minimum of 10% (based on cost) of the total materials value. If only a fraction of a product or material is extracted/harvested/recovered and manufactured locally, then only that percentage (by weight) shall contribute to the regional value. Mechanical, electrical and plumbing components and specialty items such as elevators and equipment shall not be included in this calculation. Only include materials permanently installed in the project. Furniture may be included, providing it is included consistently in MR Credits 3–7.